The Purpose: The purpose of this article is to help folks with a one year + old video card to decide if going with a new, and very expensive video card, is worth the money right now. For this reason I have compared the performance of an older GeForce card, and an older Radeon card, to the latest offerings from both these companies in several different tests. The results will show you how much of a performance boost you can expect. The Ti 4400 and Radeon 9500 are in the $160-$180 range, while the FX 5900 and Radeon 9800 pro are in the $380-$390 range. 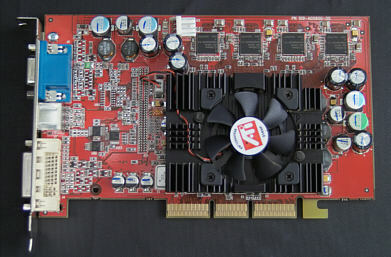 > Asus A7N8X (333MHz bus and the NForce2 chipset, with the following on-board devices: NIC, 2 IDE connectors, 6 USB 2.0 ports, standard audio out: 5 PCI slots and 1 8x AGP slot). I tested the cards with Windows 2000 (SP4) and Direct X 9a installed. The A7N8X BIOS was flash updated to the latest, 1004 version, and I installed the latest NVidia Detonator and ATI Catalyst drivers. I used Arctic Silver 3 thermal compound and installed a CoolerMaster HeatPipe Socket A cooler. It is not the absolute best cooler available (that distinction may go to the Thermalright 800/900 series), but it's darn good. The biggest problem with the Heat Pipe is that the fan on it runs at a very loud 6,500 rpm. It's the loudest cooler I've ever used, but it definitely keeps the CPU temperature low, and stable. I used the "aggressive" settings in the A7N8X BIOS, including the settings for the CPU and memory. I let the motherboard set the memory timing according to the SPD chip. It is quite possible that more aggressive manual timing settings would have given even better performance than the "aggressive" SPD memory settings. I always run the memory bus synchronously with the CPU bus. Rather than do tons of benchmark testing, I chose a few well-worn standards, including 3D Mark 2001se and 2003, Codecreatures, and UT 2003. The graph below shows the results from the UT2003 flyby benchmark. Not much news here, except that at higher resolutions the older cards fall pretty far behind. The next graph shows the UT2003 botmatch scores. It's interesting that there is so little difference between the cards in this test. I'm not sure these results reflect real life performance in the game, because I noticed a big difference on my machine when going from the Ti 4400 to the Radeon 9800, even when playing UT2003 at a resolution of 1024 x 768. Codecreatures is a high polygon-count benchmark that brings most systems to their knees. 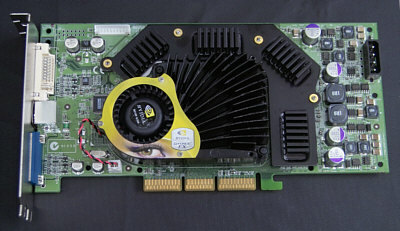 Older video cards rarely exceed 30 frames per second, even at low resolutions. Indeed, at 1024 x 768 x 32-bit color, even the two high-end video cards only hovered around 45fps, with the Radeon beating the FX by a slight margin. Codecreatures also gives data on millions of polygons per second, and in this department the Radeon keeps it's slight lead over the FX at all resolutions. The 3D Mark 2001se scores are not too interesting. This DX8.1 benchmark doesn't strain the new cards enough to really differentiate between them. At lower resolutions, the new cards aren't even much better than the old video cards. Despite all the hoopla about 3D Mark 2003 being a synthetic benchmark that does not measure real-world performance, this is clearly the one benchmark I used that clearly differentiated these two new cards from one another. 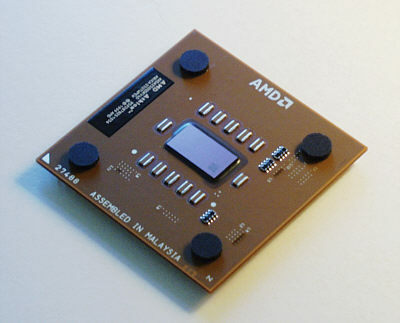 The differences observed between the 9800 and 5900 in the other benchmarks were trivial in comparison. 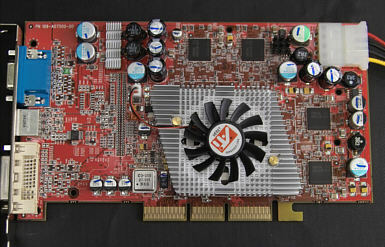 Here, the Radeon spanks the FX card. Further, the GeForce Ti4400 is pretty much worthless in this test, even compared with the 9500 Pro from ATI. Also notice that the older and very inexpensive 9500 Pro almost keeps pace with the brand new, very expensive 5900 Ultra. That's embarrassing. Keep in mind that there will not be any games using DX 9 technology until this Winter at the earliest, so there is no way currently to test how these cards will fare with actual DX9, high polygon-count games. Code creatures gives us some idea of how high polygon-count games might perform with current hardware, but it is not an actual game with artificial intelligence and plenty of bots on the screen, so we are still stuck in limbo waiting for a true DX9 title to come out, like Half Life 2 or Doom III. I should mention that as far as high-end video cards go, the Jaton 5900 has some of the worst "fit and finish" work I've seen. The heat sink had jagged edges, and seemed very poorly made when compared with offerings from companies like Asus. The Jaton card was first to market, probably because they cut manufacturing corners. If you're going to get an FX 5900, look for something from Asus, Gigabyte, or another, more reputable company. If they had used faster memory and a better cooling solution, like Asus does on their 5900 card, the NVidia card would have probably faired better than it did against the Radeon 9800 Pro. I may need to do a rematch when I can get a hold of the offering from Asus. One final comment on ATI's newest 3.6 Catalyst Drivers. They installed perfectly and quickly, and have a great deal of excellent features. I noticed only one bug. I have the Mitsubishi 2070sb Diamond Pro monitor, and I am using the Radeon 9800 Pro. These two devices are DDC/CI (Display Data Channel Command Interface) compliant devices, but NEC-Mitsubishi's "Naviset" display control applet failed to recognize my 2070 monitor. Therefore I could not use the software to adjust my monitor, and I was stuck with the front panel buttons. The problem is a known issue with the last 3 sets of Catalyst drivers. ATI says the next release will fix the problem. Conclusions The conclusions that I come to after doing this mini-review are: 1) that the Radeon 9800 Pro is a slightly better video card than the NVidia FX 5900, and that; 2) right now you probably don't need either video card to play existing games. You will probably want one by the end of the year when new DX9 games make it to the stores. But by then, newer versions of both cards should be available, and prices may be slightly lower. Rating, : 4.9 out of 5 smiley faces (98%). Rating, : 4.4 out of 5 smiley faces (88%).